It’s National Peanut Butter and Jelly day! This combo is just about the best thing since sliced bread, even though technically it’s been around a few years longer. Peanut butter debuted at the 1883 Chicago World’s Fair. It was mainly sold in fancy tea rooms until the early 1900s, when the peanut industry commercialized and peanut butter became more affordable for everyone. A home economist named Julia Davis Chandler conjured up the first known recipe for PB&J in a Boston cooking magazine back in 1901 (she recommended currant jelly). The 1928 pre-sliced bread revolution led a lot of people to eat peanut butter sandwiches during the Great Depression since it was an affordable and nutritious treat that kids could make for themselves. During WWII the U.S. Army’s food ration list included peanut butter, jelly, and bread — so give soldiers the credit for combining these tasty ingredients into the classic combination we know and love today. They brought their recipe back home, and American children have benefited ever since. Let’s give thanks to all the PB&J pioneers! 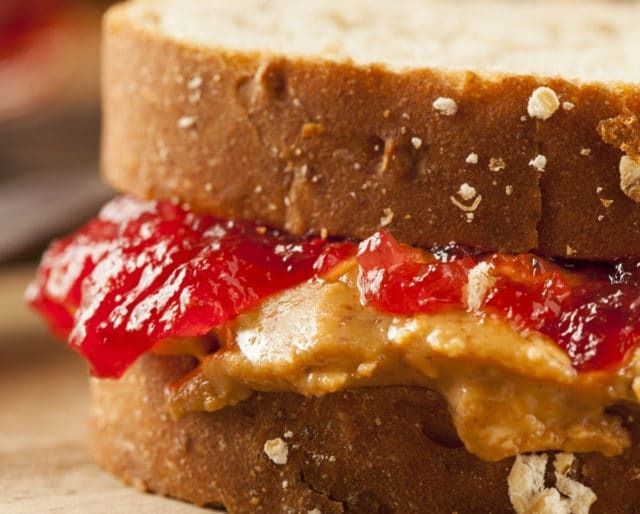 Peanut butter and jelly’s an affordable, tasty, and easy lunch we can all appreciate on April 2. PB&Js are a league-wide locker room staple in the NBA. Each team has its own tradition. Warriors star Kevin Durant even sponsored a PB&J-inspired shoe design. This dancing banana meme has since received 29 million views on Youtube, and in 2019, experienced a revival of popularity when it was turned into a character in the popular video game "Fortnite." Another leap in premade sandwich technology by Smuckers. Freezer rations were filled en masse. Smuckers released Goober Grape, a preswirled peanut butter and jelly combination in a jar. Home economist Julia Davis Chandler published a recipe for peanut butter and jelly sandwiches in the "Boston Cooking School Magazine of Culinary Science and Domestic Economics." As a "thank you" to the nice lunch ladies and parents out there who packed your PB&Js, today is the day to spread the jelly (and the love) and make a sandwich for someone else. Spread out some different jellies and peanut butters. Maybe try making your own jelly, or baking a loaf of homemade bread. Invite friends and family over to compare combinations. Today's the day to text your better half and remind them that you're nuttin' without them. Combining a legume (a bean, lentil, or peanut) with a grain (like rice, corn, and wheat) creates a complete protein. This means that peanut butter and jelly mixed with whole wheat bread gives you all of the essential amino acids your body needs. That makes it fertile ground for creativity. For example, what ratio of peanut butter to jelly do you prefer? What flavor fruit — and how chunky the peanut spread? What type of bread? Or how 'bout a peanut butter and jelly bagel? Of course, you can always add additional ingredients. Elvis liked bacon and bananas on his PB&J...and who are we to argue? This smart sammie has gotten many families through long car trips, hiking days, and school field trips. Three ingredients yield so many lunches.